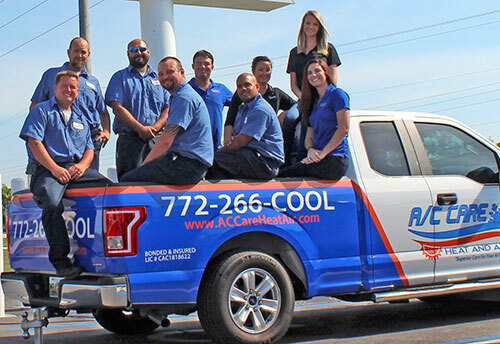 At A/C Care Heat & Air, we aim to be your total home comfort experts in Stuart and the surrounding area. Our skilled heating and cooling technicians have years of experience working on air conditioners, heat pumps, and air handlers from a variety of brands. We want your home to be comfortable all year long, so when you choose A/C Care, you’ll get top-notch service every time. We even offer financing on approved credit so you always know you can get the right heating and air services when you need them! There’s nothing worse than taking the day off to wait for someone that never shows up. Our licensed professional technicians arrive to your home on time, ready to work. If you are not completely satisfied with our installation or repair service, we will not rest until we have made it right. Air conditioning problems can occur at any time. That’s why we provide 24-hour emergency services for urgent problems. 2 Year Parts and Labor Warranty on All Repairs and Replacements. Whether new or old air conditioner, there are numerous benefits to having it routinely inspected, cleaned, and tuned-up. In making a decision to repair or replace your AC unit, here are some important points to consider. A well-maintained system keeps customers & employees comfortable, creating a productive work environment that can only boost your success. Thank you Donnie for coming out at 11:30pm on Christmas Eve to make sure that we were comfortable. It’s an immediate night and day difference! Fast, friendly, courteous, and knowledgeable. The installers were very knowledgeable, friendly, and professional. … able to fix our problem for a fraction of the cost of everyone else, but he even came back the next day to show my husband exactly what they did in our attic to fix the problem. With the warm climate here in the Stuart area, your cooling system gets a workout. If your air conditioner is past its prime, know that our air conditioning technicians install quality replacement units made by Lennox, Rheem, and other reliable brands. Replacing your air conditioner is a wise choice if it is more than 10 years old, does not do a good job cooling, or needs an extremely expensive repair. A/C Care Heat and Air is also highly qualified for all types of heating service. Our maintenance services include testing all electrical components, replacing air filters, and checking system temperatures. If your system is in need of replacement, we can install a high-quality, energy-efficient system that will last you for years to come. If your heat pump or air handler breaks down, call us for effective 24 hour emergency service! We want to be your whole home comfort provider, so we offer lots of value-added products and services like energy assessments, programmable thermostat installations, and indoor air quality assessments. You can also trust us for commercial and new construction HVAC work, ductwork, ductless air conditioning systems, and more! Serving Stuart and the surrounding areas, we offer a 100% satisfaction guarantee on all heating and air maintenance, repairs and installation services. Get in touch us here at A/C Care Heat & Air today and allow us take care of you!